On average the number of crimes reported in the areas around the stores fell by around 2 percent during the first three months of 2018 when compared with the same time in 2017, according to data compiled by NBC4’s I-Team. A sampling of crime data from the neighborhoods around some of LA’s first recreational marijuana retail stores showed no significant increases in crime reports during the first three months the drug was legal for adults to purchase in California. See a map of all the locations NBC4 checked here. Frye said Colorado’s experience with regulating the recreational marijuana market demonstrated that there was little chance of the licensed businesses in Southern California attracting a criminal element or becoming a neighborhood nuisance. "Then it was seen by the community as, 'OK, this is legit.' So now we’re going to judge you by the way you conduct business, not just by the business you’re in," he said after Los Angeles implemented its regulations. Those district boundaries are used by the LAPD to divide patrol areas and track crime reports and police calls. Next, each of those districts were searched in LAPD’s crime data to discover the total number of crimes reported during the first quarters of 2017 and 2018. 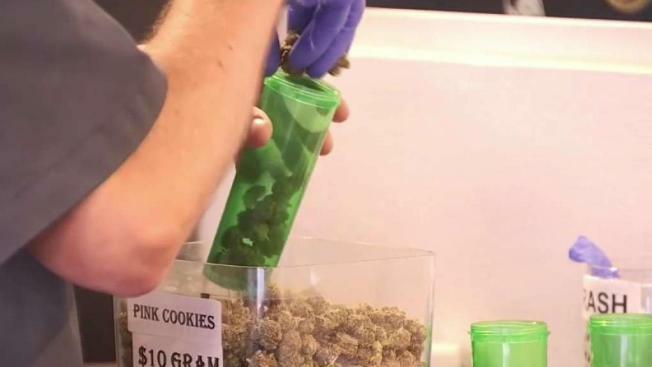 LA City Councilman Mitch Englander, who represents the north west San Fernando Valley, said few recreational stores have been operating for very long, so not enough data has been collected to draw conclusions about the neighborhood impact. “We’ll have to see what happens once it’s a free for all and licenses have been issued city wide, and we've got hundred of them everywhere. So right now I think it’s just too early to tell,” Englander said. As for the marijuana retail locations themselves, LAPD reports showed during the first quarter of 2018 marijuana stores were the scenes of six robberies, nine burglaries, and four thefts.